Our latest design in metal barricades, this metal crowd control barrier that has been thoughtfully designed to meet the needs of the majority, balancing quality and price. Our barricade is offered in two lengths, 6.5 and 8 feet. Simple and sturdy design, lasting quality and affordable. Both the construction and finish are completed in the same facility ensuring a durable and strong product. Heavy welds are used throughout. The main frame is made from a hefty 1 1/2" 18 gauge steel and the spindles 1/2" 18 gauge tube. Linking the barriers is easy by slotting together for a quick setup and dismantle. Unlike older fixed V shaped metal barricade feet, flat feet reduce the trip hazard for pedestrians with a heavy foot base plate that is welded to the removable leg allowing them to rotate and stack together with no wasted space. 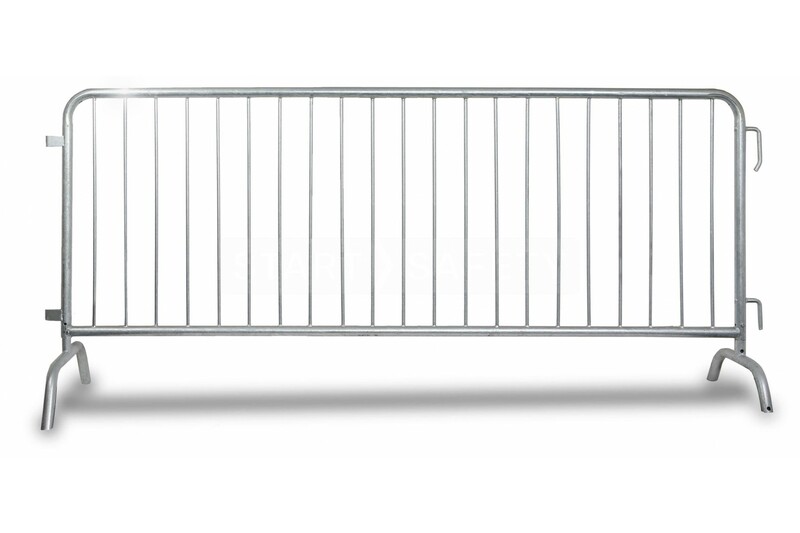 Our temporary steel barricades can be lifted with no more than 2 people and no special equipment or tools. However, we recommend that each banded stack be offloaded with a forklift truck to make the deployment as quick and easy as possible. Up to 25 barricades can be stacked together vertically in a pallet size bundle and banded for easy transport and storage. Subsequent bundles can then be stacked to further increase storage and transport efficiency. Each metal barricade is hot dip galvanized in zinc ensuring they will not rust and will stay in a presentable condition for many years to come. This is in comparison to zinc electroplating which can be damaged easier and lead to corrosion. Why not speak to our sales team on (800) 671-9662 and let us provide a quote on the best priced crowd control barrier. Width 2" including feet rotated.